Last year, French president Emmanuel Macron gave liberalism a hip young face. Now the golden boy’s shine has started to come off. Yet while some Greens like Dany Cohn Bendit did rally to Macron’s campaign, the government’s record (under center-right prime minister and Macron ally Édouard Philippe) has been feeble. Telling is the case of Nicolas Hulot, a former TV presenter and one of France’s most famous environmentalist campaigners. Having supported left-wing candidates in the last two presidential elections, last May he nonetheless agreed to become the new government’s “Minister for an Ecological Transition.” Yet soon he began to complain that green issues were being side-lined. Indeed, if Emmanuel Macron likes to contrast himself to irresponsible populists making undeliverable promises, it seems that there was more than a pinch of demagogy in his purported environmentalism. Rather like Britain’s David Cameron visiting the Arctic Circle for a photo-op with huskies, it seems Macron was more intent on using green issues to present a fuzzy image of “caring” rather than carrying forth any meaningful change. On Tuesday, a tearful Hulot announced live on radio that he had had enough and would be quitting the government. In many ways, Macron still enjoys a position of strength. His La République en Marche party leads opinion polls for next May’s European elections; his approval ratings have taken a series of hits, reaching lows comparable to that of his predecessor. The exit of the only figure in the government of notable left-wing credentials will certainly damage Macron’s shiny veneer; the cabinet is dominated by neoliberal “civil society” figures and former members of right-wing parties. As Clémentine Autain explains in this article published in Regards, with the loss of his green ally, the waters are beginning to rise around Macron. The news came like a thunderbolt. When the Minister for an Ecological Transition quit the government on Tuesday, it sparked an electric shock in Macronland, where Nicolas Hulot had been the only guarantor of environmentalist concerns. The minister surprised everyone, perhaps even himself, when he announced live to France Inter listeners that he had decided to hand in his notice. He said he had made the decision because he did not want to “become cynical,” because he did not want to “water down what he was demanding.” Because he didn’t believe in this government any more. The environmentalist leader spelled out the reasons for his failure, the government’s failure, the whole society’s failure. He criticized the government’s inability to break out of an imaginary that belongs to the time before global warming, and decision-making mechanisms, constrained by powerful lobbies, that are dictated by firefighting the latest news stories. There has, indeed, been a series of retreats. In 2017 Macron promised to uphold the previous government’s plans to cut France’s uniquely high reliance on nuclear power, but after he reached office this goal was pitched a decade into the future. In May, Hulot’s proposals to ban glyphosate weed-killers were voted down by parliament, even though Macron’s party holds a sizable majority of seats. The herbicides, notably used in Monsanto’s product Roundup, have been branded carcinogenic; supporters of the ban blamed chemicals and agricultural lobbies for sinking the reform. Plans to ban certain pesticides dangerous to public health and wildlife have also been significantly watered down — with the minister Hulot forced to defend the government. The retreats followed one after another and it looked like the same situation kept repeating itself. Putting his diagnosis out there publicly and explaining to his listeners the reality he faced, Hulot seems to have been driven to the inevitable conclusion that he should quit the government. The final straw had been the government’s measures to relax restrictions on hunting; on Monday, a lobbyist had attended a meeting on the matter, uninvited. But there had already been a lot of straws before that. Resigning on Tuesday, Hulot pointed an accusing finger at austerity and economic liberalism as major brakes on any environmentalist policy. “We set objectives for ourselves, but we hadn’t the resources; the budget constraints meant we were well aware in advance that we would not be able to see them through,” Hulot explained, even revealing that some of the environmental plans presented as new in fact do nothing but reallocate existing funds, for instance in terms of home energy retrofits. He further told of how free trade deals like CETA (between Canada and the European Union) disregard any idea of ecological markets. For Macron in particular, the resignation is a sizable shock. He has lost his green cover. The minister spoke in polite tones, but the implacable series of accusations he leveled showed how stuck in the past Macron and his government really are. Utterly unable to make plans for the long term, they are molded by the dogmatic demands of the European treaties, which focus on growth at any cost and impose ever tougher diets on the public finances. Here, environmentalism gets no more than nice words, fine intentions vaunted in so many press releases that end up lost in the labyrinth of capitalist greed. 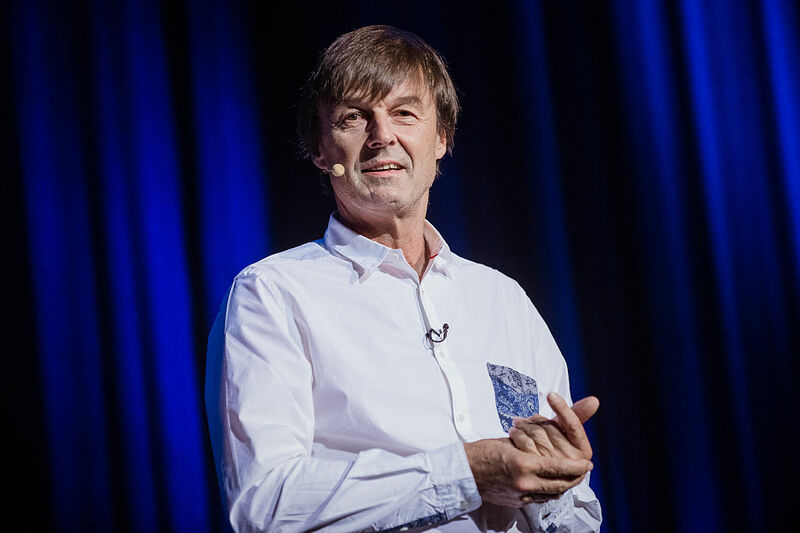 Nicolas Hulot had himself demonstrated this relationship between the environmentalist cause and the demands of neoliberal norms in his 2009 film The Titanic Syndrome. We might find it rather surprising that he did not better draw out the consequences of this reading, but instead agreed to join a government that has never hidden its faith in the law of the market. Hulot stuck with it; and the results sound like a resounding repudiation of a political orientation clearly incompatible with the vital fight against greenhouse-gas emissions, the destruction of biodiversity, and the consumerist craze. Hulot doubtless hoped to set up an ecologist rampart within Macronland. He was instead forced into a lonely position, his back up against the wall. It was as if he had discovered, to his own cost, that the government was wedded to a model more concerned for capital’s interests than for the planet. He bitterly regretted that “the dominant model” is so dubious and yet never put into question. And this was exactly what needed saying. Hulot sharply attacked the government’s short-termism — just like that of the administrations that went before it, and indeed the EU. In the radio interview in which he resigned, the former nature program presenter and founder of the Foundation for Nature and Mankind lifted the lid on the way policy is made. The environmental challenge does not seem to enter into this system’s considerations; the piles of dossiers, always treated with such urgency, respond only to the short term, to other needs, not long-term problems like the ecological transition named in Hulot’s job description. The circles of political power are too interconnected with financial interest groups to be able to answer pressing environmental needs. Hulot also made a confession that raises questions over the presence of civil-society figures in the institutional-political arena: he lamented “Perhaps I didn’t have the right codes.” But perhaps, we instead need to change the codes. That’s something that still needs doing. And what he called the “tragic” environmental situation we face is mounting at a hurried pace. The former minister deserves credit for putting all this out in the open — there on the table for everyone to see. He did so without getting set off course and while maintaining his popularity. Hulot told us that the reasons for the government’s failure on environmental questions were structural. And if that is so, then clearly, we need to change our democratic, social, and economic system from top to bottom. In a word, to rise to the challenge and find the political strength that really can bring such a break. Clémentine Autain is an MP for France Insoumise. She is a member of the anticapitalist group Ensemble Insoumis-es and is joint director of the Regards magazine.